ITEM #PTS6: NIB-FEED PLIERS. FOR PULLING OUT STUBBORN NIB/FEED COMBINATIONS FROM THE SECTIONS OF FOUNTAIN PENS. Based on tools found in tool crib surplus from the Parker factory in Janesville, these have been re-designed, in-house, to allow the handles to close more completely and thus be a more natural fit for your hand. Before using these pliers, one should make sure the nib/feed/section has been soaked a few minutes, preferably in an ultrasonic cleaner, to make things a little more prone to slide out. A little heat to make things more flexible and resistant to cracking is also recommended. Waving and rotating the front of the pen in a 150 degree Farenheit airflow for a few minutes is recommended. Once again, DON'T USE A HEAT GUN!!! They can ruin a pen in a matter of seconds! ITEM #PTS6 EXTRA: REPLACEMENT UPPER (CURVED) JAWS FOR PTS6 NIB/FEED PLIERS. These come in 2 sizes, STANDARD (That's what the pliers come with) and OVERSIZED (in case you're fortunate enough to have nibs that need pliers larger than standard sized). These jaws come on and off the pliers using a set screw in the jaws. Specify which size you want when ordering. To buy please email Pentooling. Be sure and provide a shipping address that the US Postal Service will accept. If you're outside the US, please include a Shipping phone # for use on the shipping paper. ITEM #HE-MAN: HEAVY DUTY BARREL & SECTION PLIERS. This is another obsolete item I've brought back into production after finding them in old time pen repairmen's tool kits and then finding out that nobody made them anymore. Now they are back, much more comfortable, durable, and suited for high resolution work than the less expensive stamped-out sheet metal versions. Optimally sized for most pen barrels and 6 3/4" long. In addition to gripping/turning cylindrically shaped objects, these are the only tool I've found that I can use to remove the tiered or tapered jewels from the top of the caps of Parker 75s, 45s, and similar pens without tearing the plating up. Underneath the rubber sleves there are no serrations or teeth in the jaws. ITEM #PTPARKP: Here's a genuine relic from Janesville; a pair of barrel pliers used at the Parker factory. I bought these in a load of tools from a former employee that bought out the shop's hand tools. Two pair available. 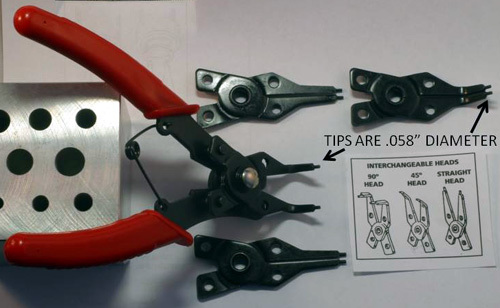 ITEM #NIBPLIERS: NIB WORKING PLIERS. I've tried for years with no luck to find a current manufacturer that makes the tiny nib pliers with no serrations on the inside of the jaws similar to the pliers found in old Parker pen repairman's tool kits. One of my suppliers used to make them, but no more. So I made my own. The picture below makes these look bigger than they are. Keep in mind that these have a total length of 3". These are very popular at pen shows. I usually sell-out. ITEM # PTS5: NYLON JAW PLIERS. These pliers have 2 square cross section nylon jaws to prevent leaving scratches and other marks on your work piece. Use these where you don't want to harm the surface of the piece you are working on. Great for straightening clips that you can get off the pen or working on flat pieces that need to be straightened and have a thin, easy to damage surface. ITEM #PTS2: SMOOTH (NON-SERRATED) PARALLEL JAW PLIERS. 5 3/8" in their largest dimension, the jaws open a maximum of .434" (10.8 mm). These are not prone to scraping up the surface of the object being held. Spring assisted opening of handles/jaws. The back of the jaws are open so a very long item can be passed through the jaws and still be gripped between the jaws in front. These are also available with a brass lining on the business surfaces of both jaws. Inquire as to availability. ITEM #PTS1: PARALLEL JAW PLIERS, SIMILAR TO ABOVE, PTS2, EXCEPT THESE JAWS HAVE FINE SERRATIONS and a groove down the long center for aligning the jaws with rods and gripping them. The back of the jaws are open so a very long item can be passed through the jaws and still be gripped between the jaws in the front. The largest dimension of these pliers is 5 3/8" and the widest the jaws open is .473" (11.7 mm). Spring assisted opening of handles / jaws. ITEM #PTS4: A NEEDLE NOSE VERSION OF PARALLEL JAW PLIERS. These are 4 5/8" in their largest dimension, having 1/4" wide jaws that open a maximum of .366" (9.3 mm) . The jaws open and close while remaining parallel to each other for a more sure, less damaging grip on the work piece. of the jaws is open, allowing you to extend a very long workpiece through the back of the jaws while gripping it with the front of the jaws. ITEM #HT-M: A scaled-down version of the larger barrel pliers. 5 5/8" long. These have no serrations or teeth on the plastic jaws. Great for gripping cylindrical shaped items without scorring them up. Made from German Stainless steel. And don't worry - the yellow plastic jaws are well endowed with stainless support - they won't bend. 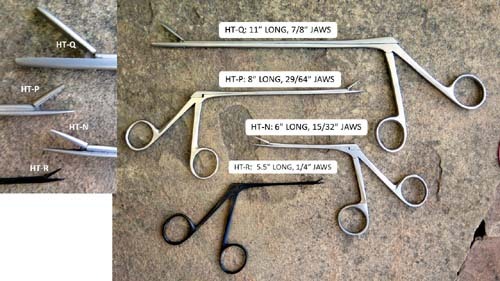 ITEM #HMST: HEMOSTATS, 5" & 7". Locking clamping devices for reaching down into barrels and grabbing onto lever mechanisms, pressure bars/J-bars, etc. Use these for strong grabbing and heavy pulling rather than the more delicate, lighter work load alligator clamps shown below. The 5" size is also available with curved jaws. Specify size & curvature (straight or curved - the 7" size is only available straight). Alligator clamps. These are very useful for reaching into barrels when working on levers & pressure bar assemblies. Unlike hemostats and pliers, the extension between the handles and the jaws does not expand, so you can reach further into narrower openings. While using these, think of them as forceps, not Channel Locks. These are delicate instruments and can be damaged with mis-use. If you want to pull-out j-bars, use a hemostat (see above, ITEM: HMST). These are more suited to removing sac remnants and assembling lever / pressure bar installations inside barrels. ITEM #HT-Q: 11" LONG TOOL WITH 7.5" LONG REACH AND 7/8"LONG JAWS. APPROXIMATELY .19" DIAMETER WHEN CLOSED. #HT-P: 8" LONG TOOL WITH 5" LONG REACH AND 7/16" LONG JAWS. JAWS ARE APPROXIMATELY .16" DIAMETER WHEN CLOSED. #HT-N: 6" LONG TOOL WITH 3.25" LONG REACH AND 7/16" LONG JAWS. JAWS ARE APPROXIMATELY .14" DIAMETER WHEN CLOSED. #HT-R: 5.5" LONG TOOL WITH 2.75" LONG REACH AND 1/4" LONG JAWS. JAWS ARE APPROXIMATELY .078" DIAMETER WHEN CLOSED. These have very tiny jaws compared to the 2 above, great for getting at smaller parts in smaller spaces. ITEM #ROBOZ: THE ULTIMATE ALLIGATOR CLAMP, FOR PERFECTIONISTS. This is an actual German made medical instrument, intended for surgical use. You'll have a hard time finding a better one than this. The same warnings as given above on the alligator clamps apply to the use and purpose of this one. It's very delicate and very precise. If you need something forceful, use a hemostat. A 5.5" LONG TOOL WITH 2 7/8" LONG REACH AND 3/16" LONG JAWS. JAWS ARE APPROXIMATELY .055" DIAMETER WHEN CLOSED. ITEM #PT624: Plastic pliers with fine, delicately rounded tines. 5 1/4", All plastic except for the spring, these are for applications where you don't want to scratch or leave marks. While there aren't none of us what likes to admit to using pliers on nibs, this is one of two pair of pliers I own & sell that are ideal for that purpose. These are great for removing nibs from Lamy 2000s and Namiki Vanishing Points without hurting the nibs. ITEM #PT621: Plastic pliers with angled nose. 5 3/4", All plastic except for the spring, these are for applications where you don't want to scratch or leave marks. These are great for removing nibs from Lamy 2000s and Namiki Vanishing Points without hurting the nibs. ITEM #PT622: All plastic pliers with stubby needle nose. 5 1/4", All plastic except for the spring, these are for applications where you don't want to scratch or leave marks. 5 1/2" long. These are great for removing nibs from Lamy 2000s and Namiki Vanishing Points without hurting the nibs. ITEM #PT620: Plastic pliers with longer, slender needle nose. 5 3/4", All plastic except for the spring, these are for applications where you don't want to scratch or leave marks. These are great for removing nibs from Lamy 2000s and Namiki Vanishing Points without hurting the nibs. ITEM #PT623: Plastic pliers with stubby needlenosed tines. 5 1/2", All plastic except for the spring, these are for applications where you don't want to scratch or leave marks. These are great for removing nibs from Lamy 2000s and Namiki Vanishing Points without hurting the nibs. ITEM #PT625: PLASTIC JAW PLIERS WITH SLIGHT OVERBITE. These were intended for rolling prongs over a stone on jewlery. They're great for gently and smoothly forming thin metal over a shape. ITEM #PT32867: Reinforced barrel pliers with a second extra tough layer of soft plastic added to the business end for longer lasting useable life. There are also re-liners available for these or other sourced similar pliers if the liners become torn. These are for safely grabbing onto barrels and 51 hoods. For the latter application, 2 pair are better. 8 1/4" long. These shrink over the jaws when heated, conforming to the shape of the jaws. Slip them over the jaws of the pliers to the position you want them in and then close the pliers and hold them in front of a heat gun (a hair dryer may be warm enough) or wave the ends of the pliers with the new liners on them over a gas flame (a BIC lighter will work). Make sure they are in the position you want them to be in before applying heat, because once it shrinks, it won't move. After they shrink enough to remain on the jaws, open the jaws and roll them around in the heat to get all sides to shrink. Use your head and don't hold these stationary over a flame. They can and will burn and start on fire if you don't keep them moving. Very quickly after they shrink, while they are still hot, squeeze a pencil between the jaws. this will leave a curved slot in the newly re-lined jaws. ITEM #PT46316: Brass lined pliers with no serrations on inside surfaces of jaws. A genle, less damaging way of gripping your piece. 5 1/8" long. ITEM #465764: Plastic / Round jawed pliers; One side has a round stainless steel jaw and the other side has a flat plastic replaceable jaw. Good to bend items without scratching or marring. 5 3/4" long. ITEM #465764J: Replacement plastic jaw liner for above. ITEM #FLAT PLIERS: HERE'S A SPECIALIZED PAIR OF PLIERS WITH THIN, FLAT JAWS. Designed to get into thin places, like under a clip. Non-serrated jaws to protect finish. ITEM #PT465762: Square / Square jawed plastic lined pliers. Both jaws are covered with a square plastic cover to prevent damage / scratching of your work piece. 5 3/4" long. Replaceable jaw liners. ITEM #PT465762J: Pair of replacement jaws for above. ITEM #PT4601205: Round nosed chain making pliers. Both jaws have a small round cross section to enable sharp bends on small diameter wire without scratching or nicking the wire. ITEM #TW 2: PRECISION TWEEZERS, 6.5" LONG, WITH TORQUE LOCKING PIN NEAR TIPS. Locking pin prevents tips from separating when twisting. Very small, long tips for reaching and grabbing tiny objects. ITEM #TW 3: PRECISION POINTED TWEEZERS, 4.5" LONG. ITEM #TWZ 1: Tweezers. 4 1/2" long, flat, wide jaws. ITEM #PT46512: Full width (as opposed to needle nosed), 1/4" wide parallel jaw pliers. the jaws are always parallel for a better, less damaging grip on your work. 5" long. British made.